First, here is a great photo of Nick Verreos and Rami Kashou at the GLAAD Media Awards Presentation in Los Angeles on April 26th. The New York Observer weighs in on Project Runway's move to Lifetime. The Miami Herald reports from Jay McCarroll's appearance. Don't miss the slide show. Tim Gunn and Bravo President Lauren Zalaznick will be among the panelists discussing "What We Watch" on Sunday, May 4th at Sunday With The Magazine in NYC. Click here for more info. Nina will judge a contest sponsored by YAZ to design the packaging for Birth Control Pills! It's called the "Step Up and Go Beyond" contest and the winner will receive $10,000. The deadline is June 30th. Regina V sends us this fabulous field report from Albany. Thank you Regina! 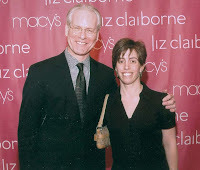 I had the great pleasure of meeting Tim Gunn on April 26th at Macys (Colonie Center mall) in Albany, NY. He was in town for the Macys/Liz Claiborne Mother's Day Fashion Show. Even though the event was slated to begin at 2pm, those of us who made reservations were told to arrive at 1pm to get in line. The line seemed to grow out of nowhere as the excitement built up. After everyone was seated - was told there were 200 seats - those without reservations stood around the back and sides of the crowd. My own seat was fabulous, being on the left side of the runway itself in the second row. The fashion show was terrific and showcased a lot of fashions that are younger and more hip for Liz Claiborne. So glad this label is moving forward to appeal to more women! Tim was gracious in offering tips for styling and accessorizing throughout the show. BPR's Ace Field Reporter, Nancy T provides us with this story from the event. Thank you Nancy. Fashion snarking from a Project Runway finalist, a world-famous established designer, and a movie star! Twenty-seven good sports parading truly atrocious dresses! A setting that any bride would kill for, complete with champagne, chocolate strawberries, pillars of pink flowers, and a lake view, but with no stress or in-laws! Sounds like Blogging Project Runway heaven. Click here to continue and to see the glorious gown that took the prize! According to this interview in The Miami Herald, Veronica Webb will not be Tim Gunn's co-host in season two of "Guide to Style." No surprise there... Who will be the new co-host? Does Tim even need one? Ricky Lizalde will be showing his designs during Escondido's Fashion Week. Jack Mackenroth gets paired up with "Top Design" winner Matt Lorenz of all people to judge a design contest in Seattle in the latest version of Reality Worlds Collide. ELLE RAISER: Though Elle and former fashion director Nina Garcia have not yet settled on the terms of their future working relationship (nor her relationship to "Project Runway," since Elle is contracted to the show through season five), the magazine elevated several staffers, including Garcia's old assistants, to fill the gap. First, Kate Lanphear, senior style and market editor who is said to be a possible successor for Garcia, has been promoted to style director. Joann Pailey, formerly senior fashion market editor, was promoted to market director. Also, Jade Frampton was elevated to a market editor and Malina Joseph has been named fashion bookings editor. A replacement for Garcia, who was fired from her position earlier this month, has not yet been appointed. This is the lovely actress Nazanin Boniadi who is in the new Iron Man movie. She is wearing a Rami Kashou design to the UK Charity Premiere. There is a clip of her red carpet arrival at about 4:57. Do you know anything about the "Shoe Star" competition? Isn't it based at FIT? What do you think of the designers? Long-time BPR and recapper, Shawn L sends us this fabulous field report from Miami - thanks Shawn! I had a really great time yesterday seeing Eleven Minutes and Jay McCarroll's fashion show afterwards at the Dorset Hotel in South Beach. I brought along my friends Aly and Jay. We all thought the film was really funny and did a great job at showing a whole other side of the fashion industry that Project Runway would never touch on. Jay McCarroll is naturally hilarious and his designing abilities are amazing. Seeing the process of having his sketches turn into real life outfits was eye opening. One of our own BPRs is the winner of the tickets to "Eleven Mintues" in Miami tonight. Congratulations, Shawn, and please send photos! Tickets to the show are still available. Rami Kashou will appear on HSN's "Scoop Style" on May 15th at 1:30 am - 2:00 am and 10:00pm - 12:00am. Rami has designed an exclusive dress for the event which will be available in black, rich peacock, lime pop, and vintage sea foam for $280.00. BPR will post more details as they become available. Last year, the Scoop Style event featured a design by Uli Herzner, which quickly sold out. Here is something fun - Check out Shoe Star. It is a contest to find the next great shoe designer. The challenges are fun and the episodes are only a few minutes long. Click here for the "Sketch" challenge. Click here for the "Green" challenge. Malan Breton is busier than ever! Malan will be at the Live Out Loud Gala on Monday, April 28th, and is also providing a silent auction item. He will also be at the "A Caring Hand" Fundraiser Gala. Malan is also working on his Resort Collection, designing accessories, and plans to introduce menswear very soon! He also answers your excellent and intriguing questions. This weekend, Malan will be showing some of his designs at the Chinese Mei Society. Here is a promotional clip - look for a glimpse of Malan. Chris March has created a red-carpet-worthy dress for "Cry-Baby" producer Elan McAllister. Read more here. Thanks Eric, Sabrina and Bruce. Speaking of Chris, iVillage has info about an "Ugliest Bridesmaid Dress" contest and Chris March will be one of the judges! Click here for an interview with Jay McCarroll in The Toronto Star. Our next podcast will be with the always-debonair Malan Breton. Please submit your questions for Malan to Team BPR. Thanks everyone! BPR Field Reporter Ashley R sends us this great report. Thanks Ashley! 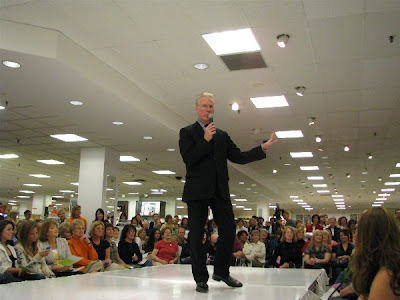 I went to the Tim Gunn event here in Louisville on Saturday, and had a great time. I was really impressed with how organized it was. Everyone working the event was great and seemed to be very happy to be there. Kelly Ripa Wore a Rami Kashou Design on "Live" Today! First, we have a note from Dan Renzi - our favorite Miami-based blogger. Dan is helping out at the Miami Film Festival and wants you all to know that there is a drawing for two tickets to the Eleven Minutes on Friday. The winner also receives 2 VIP tickets to the after party, including the fashion show and a chance to meet Jay McCarroll backstage. To enter, email elevenminutestickets@gmail.com. The winner will be announced on Friday. Yes, that WAS Jack Mackenroth playing the part of a corpse last night on Law and Order. Congratulations, Jack. After watching the opening minutes of the show I switched over to the "Real Housewives of NYC Reunion" and I have to admit - I loved it. I have enjoyed the entire season - except that it was far too short. Those women are FABULOUS!!! Q: Can you tell me about the move "Project Runway" is making from Bravo to Lifetime? A: I'm very loyal to Bravo and my own show ("Tim Gunn's Guide to Style") is coming back for a second season on Bravo, so I feel a bit like a polygamist. The viewership of Lifetime is well over double that of Bravo. I have such huge regard for the show and am so thrilled to be part of it, I'm delighted to bring it to an audience that's bigger. Am I sad to leave Bravo with "Runway"? Yes, I would be dishonest if I didn't say that. But am I excited about Lifetime? Yes, I am. Attention Toronto: Tim Gunn will also speaking at The ELLE Show on Sunday, April 27th. Click here for more information. Meanwhile, Christian Siriano will be at Notre Dame tonight. Says Garcia of her "Runway" stint: "It has all benefitted the magazine and myself. I don't consider myself a television personality. It's something I never anticipated doing." Garcia reports she is in discussions with Bravo and the Weinstein Co. about developing future shows. "I don't want to do another makeover show," she says. "New projects come to me every day." More about the crossover between the Fashion Industry and Reality TV here. It is interesting to note that Desiree Gruber and Jane Cha are producing the new Elle-magazine centered reality show, "Perfect Fit" for the CW. This may be worth a look...Of course, with Anne Slowey as a judge... Maybe not. Christian Siriano recently visited the office of Seventeen Magazine. Click here for more. Be sure to check out the newly updated Style Studio on MSN.com for tips from Laura Bennett and Nick Verreos! More photos from Christian Siriano's appearance on Ugly Betty are here on AfterElton. E! News is following the Nina Garcia story. 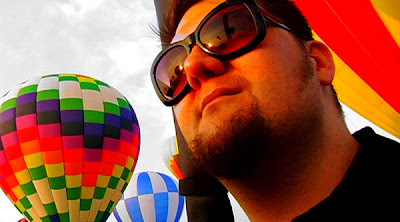 EDGE Boston features a new interview with Jay McCarroll. More gossip from Ninaville here. 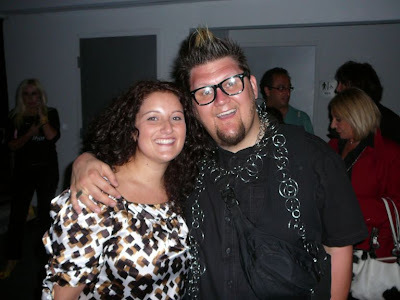 BPR Field Reporter Stacey N was on hand at Nick's appearance in Madison. Thank you Stacey for this great report! Nick was his FIERCE and FABULOUS self! (And he smelled really good too!) We've all seen the designers on the show, but I was glad to see that the "real" Nick was not any different from the one we got to know on PR. Miami on April 26th followed by a Fashion Show. Jay, Michael and Rob will be there. The film will also be in Toronto on April 24th and 25th, and Boston on the 24th and the 28th. Click here for Jay's latest blog entry. Cheetah Girl Adrienne Bailon wearing a Rami Kashou design - also at the US Weekly "Hot in Hollywood" event. Cute shoes! There are a couple of interesting items in this release from Variety. First, Season Five on Bravo will be 14 episodes. That's nice to know... BUT - the five-year deal with Lifetime includes 28 episodes per year for a total of 140! Two seasons per year, BPRs. Fall and Spring Fashion Weeks perhaps? Here is the really long run-on sentence describing this: "Any matching would be convoluted because the Lifetime deal encompasses not only 140 future episodes of "Runway" (28 a year over the five-year length of the contract) but 70 Weinstein movies, and two more 14-episode reality series: a half-hour spinoff called "The Models of Project Runway" and "Project Pygmalion," a career-makeover show in which an average woman goes through a training drill with experts and consultants to learn about a discipline she aspires to pursue." Meanwhile, the latest Ninaville gossip from Jezebel. I'm actually kind of hurt that I haven't observed any of this on BPR. It wasn't long ago that Nina appeared on a talk show (I think it was Larry King) and when asked, declared that she didn't read blogs. Check out Nina's take on Spring trends here at Flypaper. 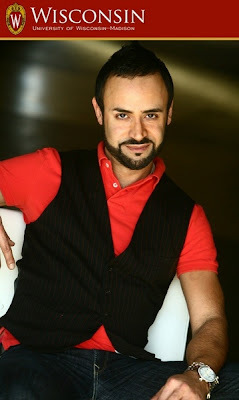 Project Runway Season Four Finalist Rami Kashou answers BPR reader questions with Laura K. Click here for the podcast. Rami dressed Heidi Klum for the annual US Magazine Hot Hollywood event when she was honored for her style by that publication last night at Beso, the new Eva Longoria Parker restaurant. From Ninaville: The Cut reports that WWD reports that Harvey Weinstein might have said that Nina Garcia might remain a judge on Project Runway. Thanks for that. Radar offers up more gossip. More from behind the scenes at "Fashionista?" Will you watch? Attention Madison Wisconsin: Nick Verreos will be speaking at the UW Memorial Union tonight at 7:30. Click here for more info. Our friends at Newsday have posted a great video of the Los Angeles Season Five hopefuls. Good luck everyone! 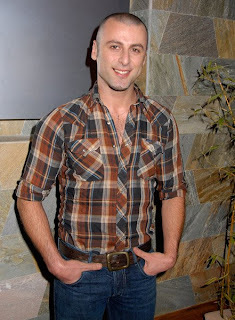 Click here for a Jonathan Kayne (aka Kayne Gillaspie) model casting in Atlanta. Variety reports on the new Bravo schedule. Click here for the story from People Magazine. 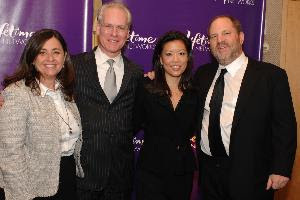 This is Susanne Daniels, Tim Gunn, Andrea Wong and Harvey Weinstein at the Lifetime Network Press Lunch. Click here for more. More from Lifetime CEO Andrea Wong in the Los Angeles Times. WWD Perez Hilton and Jezebel offer up some gossip. It would be nice to get something "for the record" from Elle. Finally - something fun! Attention Miami models - Jay McCarroll is casting models for his fashion show on April 26th following the screening of his movie. Click here for more info. Thanks Dan! Team BPR thanks our Washington-based field reporter, Renee, for this fabulous field report. Last night (Apr. 14), Arena Stage in Washington, DC held its 16th Annual Arena Stage Benefit for Community Engagement show "Play On" in Arlington, VA. This fundraiser supports education and community outreach programs at the theatre, primarily focusing on young people and teacher education. The all-star cast included members of the House of Representatives, the Governor of Virginia, Tim Kaine, local television celebrities, sports figures, owners of the D.C. sports teams, actors and actresses AND our own Tim Gunn. ...no mention of Veronica Webb. The second season of Bravo's "Tim Gunn's Guide to Style," hosted by Tim Gunn, will premiere later this year. Each episode will chronicle one person's fashion dilemmas and introduce the answer to all their troubles – Gunn himself, with his inimitable style, propensity for coaching and encyclopedic expertise in fashion. With his tutelage, deserving folks in need of some change will get the makeover of a lifetime from the man Entertainment Weekly called "a major arbiter of style." After joining the Bravo line-up in the fourth quarter of 2007, "Tim Gunn's Guide to Style" marked triple digit increases for its Thursday 10 p.m. time period, up 113 percent among adults 18-49 and up 92 percent in total viewers versus fourth quarter of 2006. "Tim Gunn's Guide to Style" is produced by Stone & Company Entertainment, with Scott Stone and Sarah-Jane Cohen serving as executive producers. Project Runway Season Five Premieres in July! Bravo Press confirms that Season Five will premiere in July. We are guessing that the Final Challenge will be at Bryant Park in September. This is similar to the season three schedule and is certainly welcome after the long break between seasons three and four. Did you miss Laura Bennett's last appearance on QVC? Have no fear, you can still order many of her designs online. I asked Laura about her signature v-neck dress. I was looking for the rhinestone brooch and didn't see it in any of the photos. Apparently this was very popular because Laura says that, "The dress with the brooch is only available in limited sizes. It does come with the brooch, though it is not pictured on the website." I asked about her bestsellers. "The metallic wrap sweater sold very well, I think there are a few pieces left." The website includes links to video clips of Laura's on-air presentations. Laura Bennett brings a touch of glamour to everyday living! The links don't take you to the individual items - sorry! Just enter "Laura Bennett" in the QVC search box to see everything. First - Harvey Weinstein speaks here. Highlights include confirmation that season six will premiere in November and that there are two more reality shows in the works. 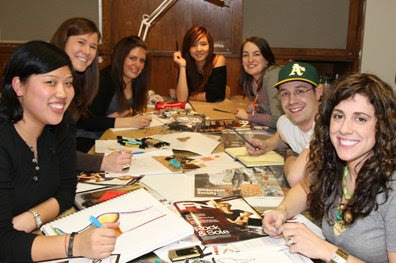 One is a reality series focusing on the Project Runway models. More from Lifetime here, and here. Meanwhile in Ninaville....WWD reports that Nina may have been offered a smaller role at Elle. Will she remain as a "contributor" or "editor-at-large?" This article confirms that Elle remains a sponsor of Project Runway for season five. Update: More here from the LA Times. Miss Alaska, Courtney Carroll, received the Miss Photogenic Award at the Miss USA pageant wearing a Nick Verreos gown! Read more here on Nick's blog. Congratulations Nick and David! We asked Bravo if Nina Garcia will return as a judge for Season 5 of Project Runway, regardless of her affiliation with Elle. A spokesperson from Bravo just told us that "we expect her to return for Season 5". Whether that pans out or not remains to be seen. Stay tuned! 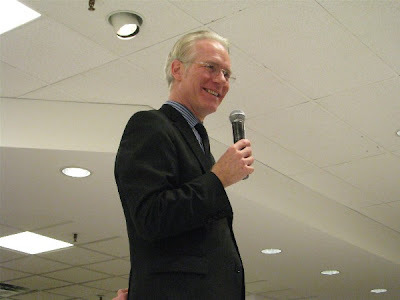 BPR Field Reporter, PRAddicted, was on hand for Tim Gunn's appearance in Danbury, CT. Thanks, PRA. The Liz Claiborne “Style Your Closet” event brought a long-awaited bit of spring to Connecticut with it!! My niece and I arrived at the Macy’s in the Danbury Fair Mall about an hour ahead of time and found we were about 50th in line. Needless to say, the event turned out to be standing room only. Click here to continue. This press release reveals that the "Project Runway fracas isn't pretty." Click here for the latest installment of "Case Clothed" with Laura Bennett. The city of Los Angeles honored Rami Kashou (source). The Hollywood Reporter weighs in on the Bravo/Lifetime shift. 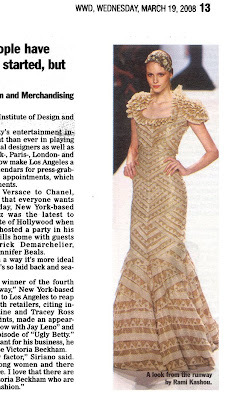 The New York Times tosses in two cents, one of them contributed by our very own Laura K.
Portfolio.com has a feature on Project Runway Season 5 casting. Don't miss the slideshow. Thanks, Tilli. MSPMag.com has a couple of videos up featuring Tim Gunn. Click here and here. Philly Chit Chat was at the after-party for the premiere of the Jay McCarroll documentary 'Eleven Minutes.' Don't miss the photos of Miss Martha Graham Cracker. 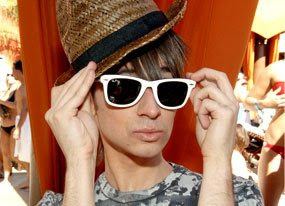 Finally, a random Christian Siriano photo from his Vegas days. Can you think of a caption? Elle to Nina Garcia - "Auf Wiedersehen"
Thank you to all that have sent links. It appears to be true from the sources that we have investigated. Women's Wear Daily broke the news that Nina Garcia and Elle Magazine have parted ways. US Magazine and TMZ quickly followed up. A Saturn spokesman told Ad Age, "We're definitely a major sponsor of Season Five, which is in production and will run on Bravo this fall." He could not confirm their plans for the move to Lifetime. Season 5 to run in the fall? That's news to us and further questions Lifetime's announcement of a November premiere for Season 6. Assuming that the Magical Elves could somehow pull this off, could we really be faced with the prospect of two new seasons running concurrently on competing cable channels? ...a Bravo spokesperson confirmed all of Season Four's integrated sponsors -- Elle Magazine, L'Oreal Paris, Alberto-Culver's Tresemme, Saturn and Bluefly.com -- will be returning for Season Five. There is much more in this article, including specific advertising revenue figures. Did you know Top Chef pulls in more ad revenue than Project Runway? Click here for the whole thing. 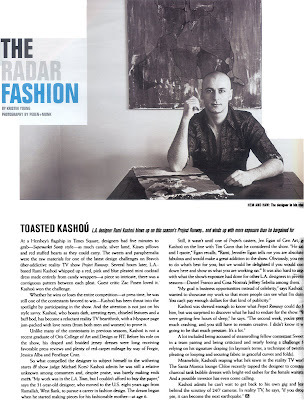 Rami Kashou's design is featured in StyleSpy. Click here for an audition story from Phoenix designer Jes Switaj. Tonight is the Miss USA pageant. Christian Siriano is a judge and Nick Verreos has designed the gown for Miss Alaska. Check it out here. More audition stories here, as well as a quote from Rami Kashou. 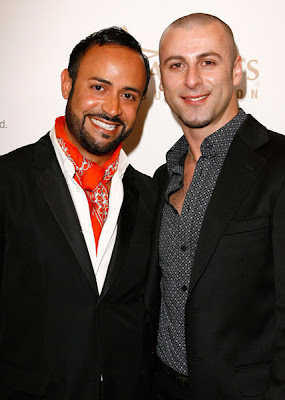 Project Runway Season Two designer Nick Verreos talks with Laura K. Nick answers reader questions, provides insight into three seasons of auditions, offers fashion advice and talks about Runway's move to Lifetime. Photo of Nick Verreos with Miss Universe 2007 Riyo Mori in Las Vegas on April 10, 2008 courtesy of WireImage. Kevin Christiana is featured in the current issue of Talent in Motion magazine. Also stay tuned for news about Kevin in a future issue of Cosmogirl. Victorya Hong has a new blog! 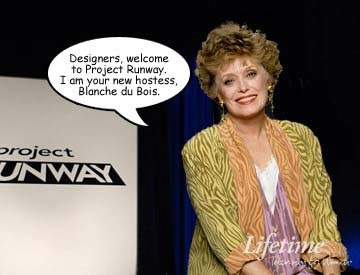 The Defamer weighs in on the Project Runway move to Lifetime... Hee. Finally, more press on the Jay McCarroll premiere here. The Scarlett and I hopped on a train from Philly to NYC to check out the auditions on Sunday. We were hungry when we arrived and Malan Breton met us for lunch before we all headed over to the W Hotel. There were about a dozen designers lined up. The always-friendly GenArt reps let us know that 200 had auditioned in the first two days in New York. Click here to meet more of the Season Five Hopefuls. The Fashion Professor, Anthony Cady, with Jay McCarroll at the premiere of "Eleven Minutes." 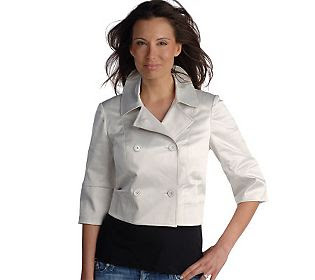 This Top Chef apron featuring Laura Bennett as illustrated by Robert Best is available here. Cute! Rami Kashou will be honored and recognized for his work this Friday by Los Angeles City Council President Eric Garsetti. Congratulations Rami! Click here for more information. Laura Bennett will be back on QVC this Friday. The PRGayboys have all the info. There is a great video interview with Jay McCarroll up on VIMBY. Thanks Amy. Christian is sure to be adorable on Ugly Betty! Nina Garcia is also scheduled to appear. Our podcast this week is with Nick Verreos. Please submit your questions for Nick to Team BPR. First here is video from Tim Gunn's stop in Oklahoma City. Of course the mailbox is filled with many news items about the switch to Lifetime. Most are just re-hashing information that we have already posted. I promise to be judicious about the articles that I include. First here is Jim Cantiello's take. He is not amused. Click here for The Cut. The best part of this Wall Street Journal item is the following comment - YIKES! A lawsuit based on the word of a Hollywood producer and an e-mail from a Hollywood agent. NBC executives must be real aliens, from another planet, to trust and rely on the word of Harvey Weinstein for anything. Weinstein has made a career of lying to people he deals with. He and his brother would promise to distribute movies made by independent and overseas production companies, then do nothing. When he knew he was leaving Walt Disney, he delayed until the end of his contract the release of The Great Raid, a $70 million war movie that was a near total loss, its box office revenue covering its advertising cost. The only thing NBC has going for it is that David Boies is representing the Weinsteins. All Boies knows is how to overbill clients paying for his reputation, not his legal skills, which are history. Prediction - The next lawsuit will be Boies suing to collect payment from the Weinsteins for his legal services. That case should end up in the US Supreme Court, the Weinsteins like taking, not paying. Meanwhile, in other news...Check out Alison Kelly's new "Tulip" dress at Dahl. I was delighted to be able to travel to Philadelphia for the World Premiere of Jay McCarroll's documentary "Eleven Minutes." The Scarlett lives in Philly and she and her charming husband graciously hosted my visit. The film was scheduled to start at 9:30 so we had some dinner first and headed to the theater. When we arrived there was a long line of people in front of the venue waiting to get in. YAY! The doors opened and the theater filled up. I checked my phone to discover that I had missed a call... It was Anthony Cady! Our Fashion Professor. He and his wife had driven down from New York for the premiere. It was great to finally meet him in person. Anthony made all of the leather-free shoes for Jay's collection and he is featured in the film. His daughter also has a charming "cameo." The show was about to begin, but first we were all welcomed by the organizers of the Festival. The filmmakers, Rob Tate and Michael Selditch were introduced along with Jay. I took a photo (above) so that you could see what it was like. Michael is wearing one of Jay's designs which was featured in the Fashion Show and in the film. The Minx has all the scoop! Yes it appears to be true. Project Runway will be moving to a new network. Thanks everyone for your links. I have just gotten off of the phone with Andy Cohen and he said, "We have poured our hearts into the show. We love it." He sounded very distressed. Runway remains with Bravo for season five. Let's start with Mo Ryan. Here is the story from the Lifetime. If you missed the world premiere of "Eleven Minutes" at the Philadelphia Film Festival on Saturday you have another chance today at 5:00 at the Prince Music Theater. We are told that Jay will be on hand for a Q&A after along with co-directors Michael Selditch and Rob Tate. Tickets can be purchased at the venue. Click here for more details. Look for a report here later on Saturday's premiere. Meanwhile, you can now shop online for Jay McCarroll merchandise. Click here! Dateline: Saturday, April 5. There was a line around the block at the Times Square Starbucks. New flavor of Frappacino? Not quite. Instead, about 60 people were waiting to get into the W Hotel for their Project Runway interviews. Along with their portfolios, dress racks, and mannequins, they brought their friends and well-wishers. This group consisted mainly of talented amateurs, rather than the more experienced participants of Season 4. But, there was one familiar face in the crowd. We caught Jack Mackenroth surveying the incoming talent at the Saturday auditions. Eying his competition perhaps? If so, he’s the most gracious (and buff) competitor we’ve seen in a while. He was wishing everyone good luck, posing for pictures, and giving helpful audition advice to nervous designers. When asked if he was planning on coming back for Season Five, he said "Well, Heidi asked the same question on the reunion show. Since then, I've come to realize how important it is for me to finish what I started. It was so amazing the first time around. So, I've expressed my interest in coming back. I'm really excited about the possibility, and just have my fingers crossed for it to all work out again." Click here to continue reading Nancy's report from NYC and hear more from Jack! This photo is from WWD! Meanwhile, The Scarlett and I were at the premiere of the Jay McCarroll documentary last night. It was a thrill to meet Rob Tate and Michael Selditch, the co-directors of "Eleven Minutes." Also, our NYC Field Reporter, Nancy T, was at the Project Runway Season Five auditions yesterday. She spoke with Jack Mackenroth and several of the "hopefuls." Photos and report to follow. Season Four designer Sweet P talks to Laura K about the show, her favorite challenges and her life in Los Angeles. Sweet P's husband Sage Vaughn is an artist and they have recently returned from an art event in New York. Can you guess who they had dinner with?